What did JPL's 1939 lunar lander look like and what practical aspects of landing on the Moon did this engineering design address? 6Launius, Roger (2002). To Reach High Frontier, A History of U.S. Launch Vehicles. University of Kentucky. pp. 39–42. Question: What did JPL's 1939 lunar lander look like and what practical aspects of landing on the Moon did this engineering design address? Looking at the source that Wikipedia provides (To Reach the High Frontier: A History of U.S. Launch Vehicles, pp. 39-42), there's no evidence that GALCIT designed a lunar lander in 1938-1939. What the source does say is that the British Interplanetary Society (BIS) designed a lunar landing vehicle in 1938-1939 which later influenced the Apollo Lunar Module. So, I think the statement in Wikipedia which you have boldfaced in your question is a misreading of the source by the Wikipedia editors. 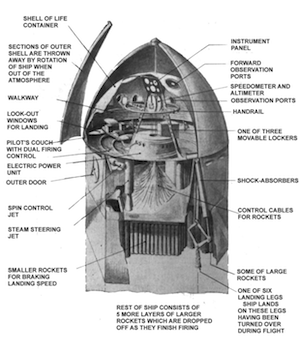 The BIS lunar spaceship design in 1938-1939 used mostly solid fuel rockets, meaning a large number (5) of Earth-to-Moon propulsion stages, together with a sixth stage for landing on the Moon and returning to Earth. See 1, 2, 3. Crew capsule from the BIS lunar spaceship. Not the answer you're looking for? Browse other questions tagged the-moon history lander jpl or ask your own question. Which Chinese citizen co-founded JPL? Who are JPL's “founders” in general? What would a lunar eclipse look like from the surface of the moon? How did they sweep dust on the moon from inside the Apollo Lunar Lander? What proportion of a space craft soft-landing on the Moon would be payload? What is the soonest manned lunar landing date? How did the Lunar Module dock with the rest of Apollo 11 and what is the “CSM”? Bombing Moon and Mars: What would it look like? How exactly did the floor of an Apollo LM look like after EVA(s)? Seeking photo! What did Karman's original “Karman line” calculations look like?